We had our first real snowfall on Friday. When Rosebud woke up, she was so excited to see snow. Unfortunately, both of us have been fighting off colds for the past few weeks so I’ve only taken her out a couple of times since the weekend. However, I figured why not bring some snow inside to play with? I don’t have to stand outdoors and freeze and she gets to play with snow. An almost perfect compromise. 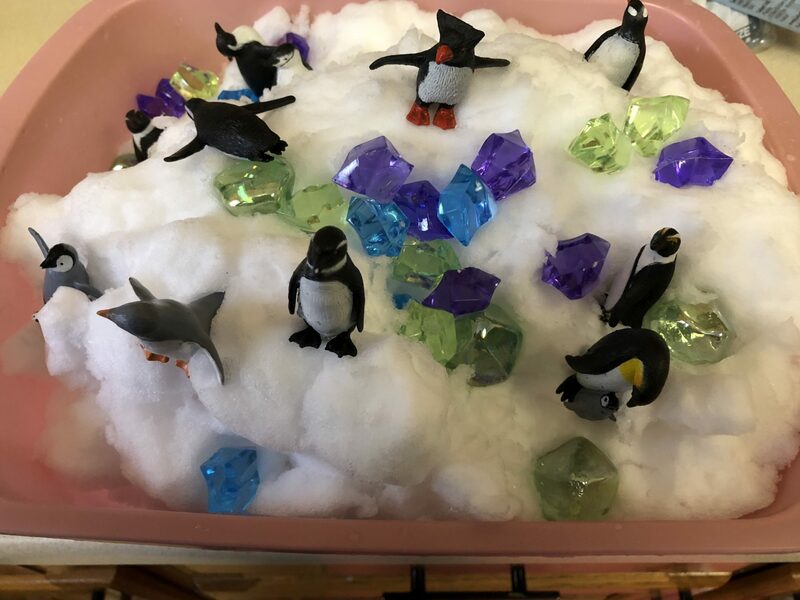 Here’s what I put in this sensory tub. The stones and acrylic crystals were our treasures. She liked those the best. Digging in the snow and watching it fly everywhere. She loved finding the different penguins. Of course, those scoops and shovels were used to dig and uncover those treasures. Not to mention the added benefits of getting snow all over mommy. 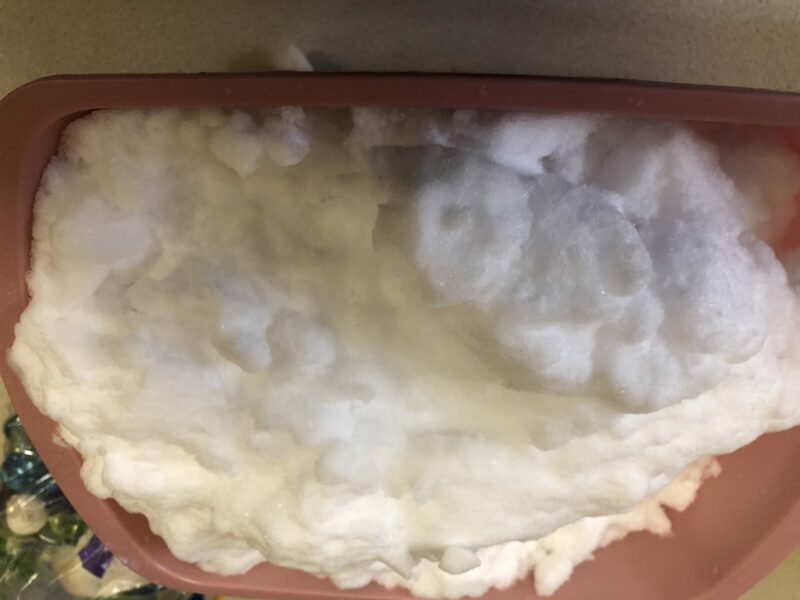 It was the perfect snow to make snowballs and we found out that when we put it into the little containers, the snow would be shaped like them when we took it out. We watched how snow melted and how we could put it together and break it apart. It’s play, it’s science and it’s fun on a winter day. What are some of your favorite winter activities? Let me know in the comments. What a great idea! I’m not a fan of snow! I’m not a big fan of snow either. I like watching my daughter enjoy it though. Thanks for your comment. Thank you for commenting. Glad you liked it. 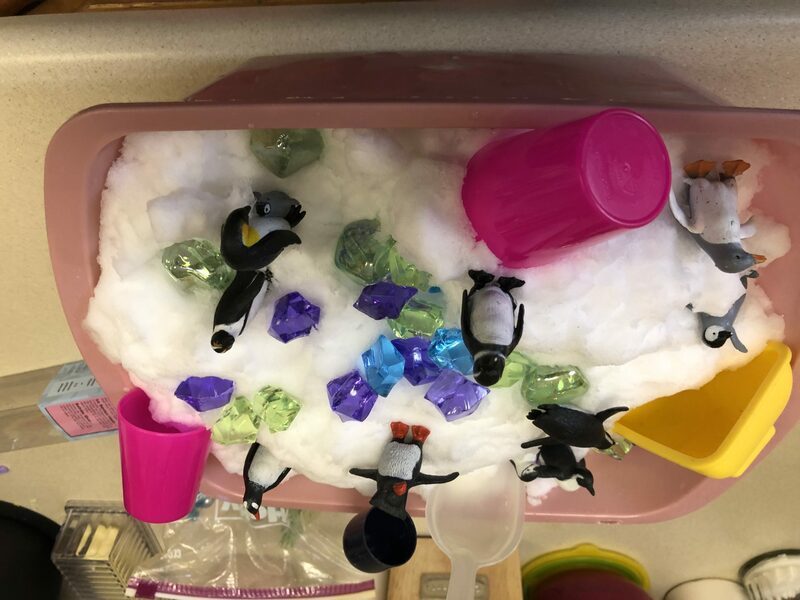 what an awesome mom move, letting a kiddo bring snow INSIDE! That is such a great idea! We like to use foam balls to have ‘snow ball fights’ and make sheet igloos with a sheet and fan! I don’t like the cold but I don’t mind playing inside! 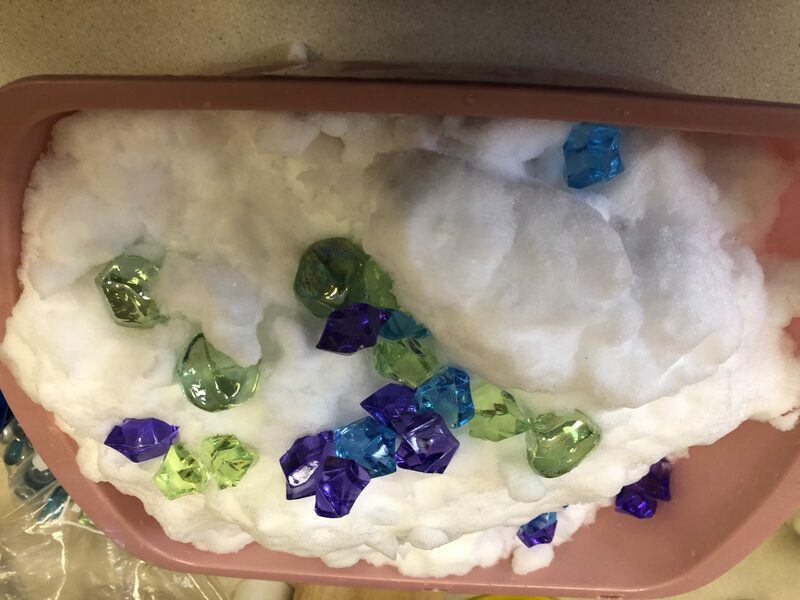 I’ll have to give the snow in a tub a try this winter! Thanks for sharing your fun! The sheet igloos are a great idea. I’ll have to try that. Thanks for commenting.